We demolished the existing garage and disposed of it. We then designed and built the 2 garages using brick and tile to match the house. 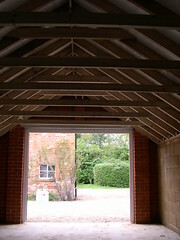 An attached garage can be built in different styles according to the space available. ABD Construction can help with all aspects of the garage build from finding planning permission for building to preparing foundations for the garage structure, from the fitting of exterior and connecting doors in walls to building slated roofs to compliment your home's roof.